During the afternoon of Friday 23rd of August 1940 Rose Perrott of Barton on Sea was a young telephone operator in the exchange situated on the top floor of the Post Office in Station Road, New Milton. She had been receiving calls from Lymington Town Hall advising that enemy aircraft activity had been spotted. She transferred these calls through to the ARP office and ensure the Fire and Police service were aware. An orange alert call came through advising that enemy aircraft were in the vicinity. An orange alert was a level below a red alert. 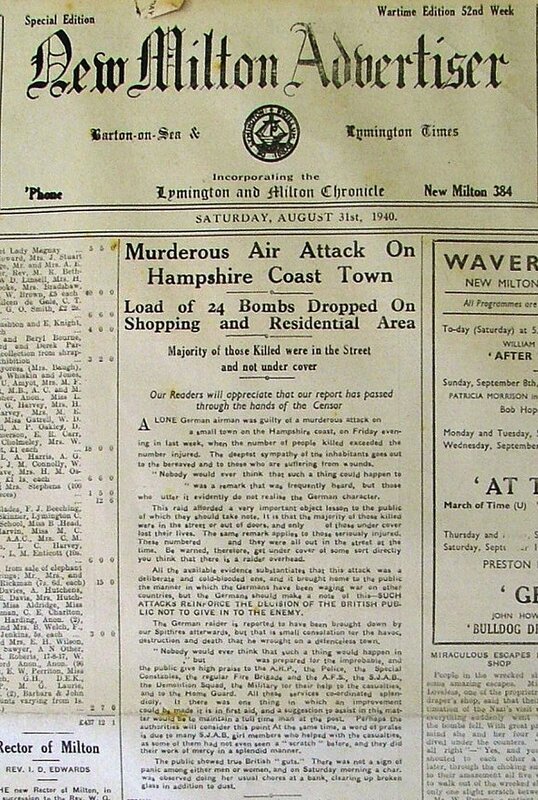 On receipt of a red alert the air raid siren would have been sounded and the people of the town would have taken shelter. After she transferred the call, Rose said to her colleague on the switchboard “I will make us a cup of tea before anything nasty happens”. When Rose went through to the kitchen area on the top floor she had a good view over the roof tops of Station Road. She saw an aeroplane coming towards the town. As it grew ever larger Rose thought it was dropping leaflets. Suddenly there was the first of many loud explosions. Rose and her colleague ran down to the basement of the post office and took cover. After the explosions stopped both young women stayed in the basement for a few minutes before Rose decided to return to her post on the switchboard as she knew lots of emergency calls would be made. She was right. Every light on the switch board was illuminated. Just after 6.00pm Nine year old John Hutchins was stood outside what is now Charles Nobles jewellers shop at the crossroads in Station Road. He was with a friend, Ivan Bryant. Both of them were trying to collect some souvenir cap badges from passing soldiers. John recalls shoppers and workers going home and some vehicles driving though. Suddenly a lone Heinkel 111 flew over the town. The aeroplane was low enough for the crew to be seen inside. The aircraft flew out in the direction of Sway and then circled back. He saw what he at first thought were leaflets falling from the Heinkel. He quickly realised that in fact they were bombs. He recalls that the soldiers of the 2nd Battalion Lancashire Fusiliers, who were based in the nearby Fernhill Manor School, were bravely running down the street shouting at everyone to get under cover. At this point John and Ivan became separated. John was pushed around the corner and into the shelter of Boots the chemist, this shop is on the opposite side of the road to the current Boots Chemist in New Milton. Ivan, meanwhile ran south, down Station Road. The explosions of the bombs caused all of the bottles in the chemists to fall off of the shelves. Once the explosions had stopped and the dust had settled the shop owner pushed him out of the back door in the general direction of the fire station and told him to go home. John recalls that he saw the Police and Fire Brigade were very quickly on the scene. There was a cordon across the Old Milton Road, and John noticed his father, who was the chief fire officer on duty, examining the bodies lying in the road. He now realises that his father was on duty but at the same time was searching for his son, who he knew was in the area at the time of the raid. John shouted across to his father, who came over to him. His father was overjoyed to see John but gave him a painful clip round the ear and told him to get home to the fire station and his mother straight away! Twenty civilians and four soldiers were killed in this attack. The casualties would have been worse but for the bravery of some of the men of the Lancashire Fusiliers who ran down Station Road just prior to the attack and shouted to everyone to get under cover. The tragedy and indiscriminate nature of the attack can be demonstrated by recounting a few of the victim’s stories. 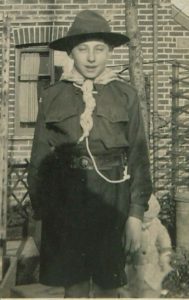 Archie Bursey was a 15 year old telegram messenger boy working for the Post Office. He was in the process of delivering a telegram in Old Milton Road near to the cross roads and was killed instantly. Archie was a member of the 1st New Milton scouts and his coffin was escorted to the church yard by fellow members of the troop accompanied by the scoutmasters. 30 year old Alfred Probert from Boldre along with his wife Hilda and their 4 year old daughter Jeanette were riding through New Milton on the family motorcycle and sidecar. 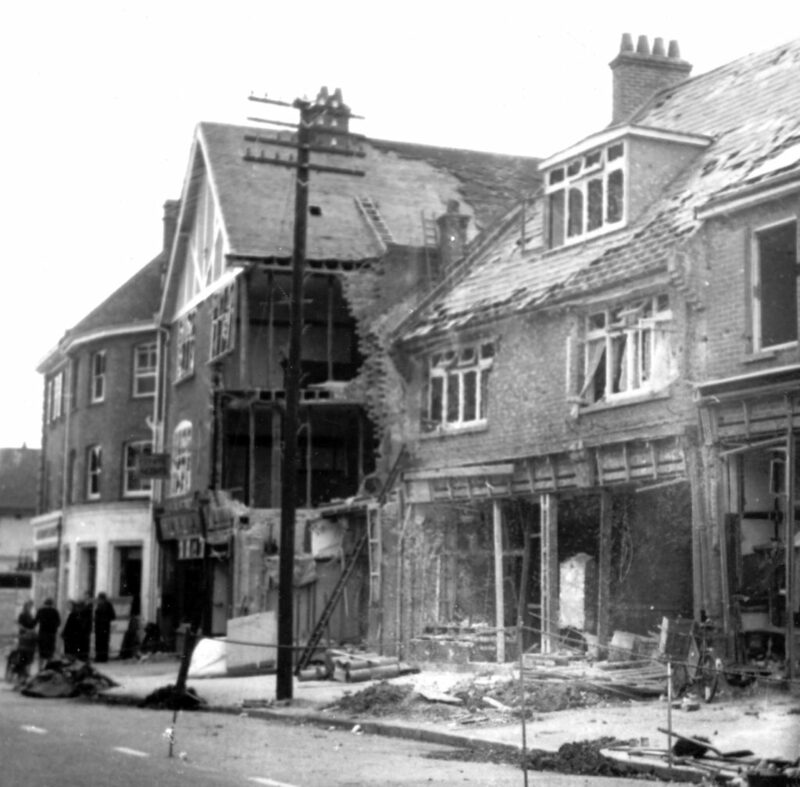 They had just turned into Old Milton Road from the crossroads when the bombs struck. All three of them were killed in the road beside the war memorial cross. Corporal Thomas Davies was serving in the 2nd Battalion the Lancashire Fusiliers. He was based at Fernhill Manor School which had been requisitioned for the duration of the war. He had been granted 48 hours local leave. His wife, Evelyn, had travelled down from Preston by train to be with him during his well earned time off. 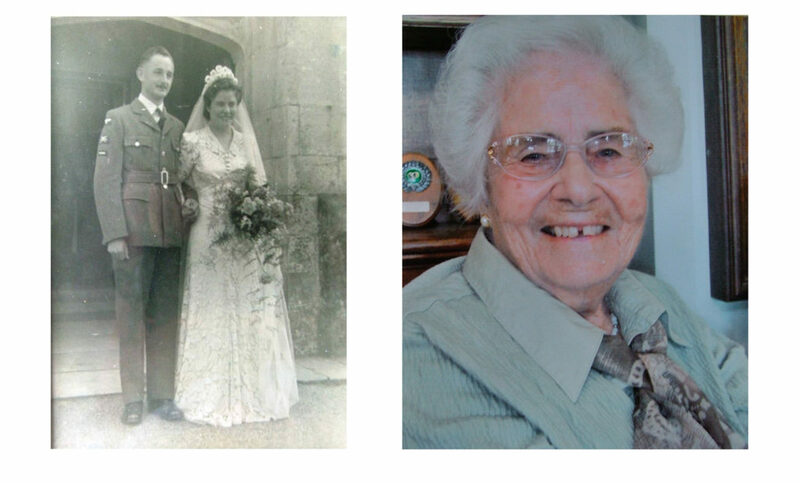 Davies met his wife at New Milton Railway Station and was walking down Station Road with her when the bombs struck. Thomas Davies was killed in Station Road. His wife died of her injuries at the Milford on Sea Hospital. 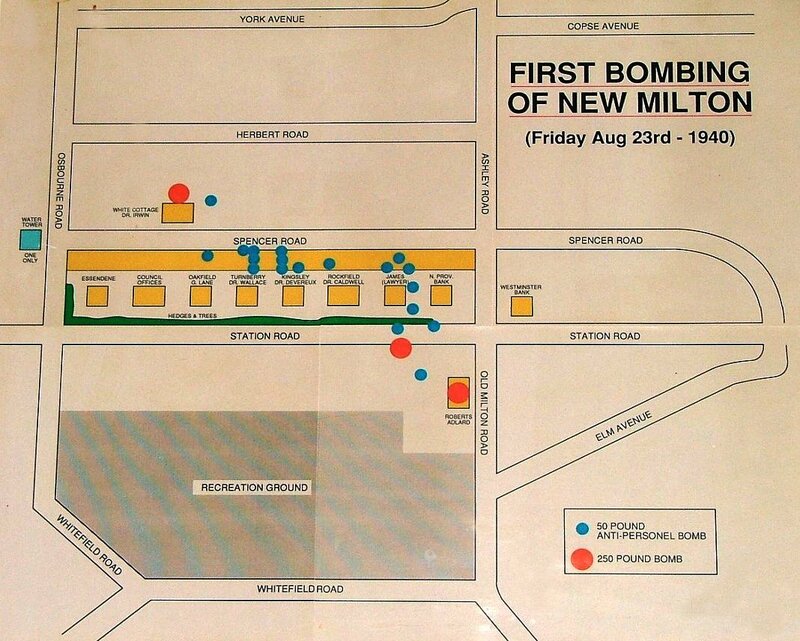 The bomber dropped 24 bombs in a line from Old Milton Road across Station Road and into Spencer Road. When the lone German raider returned to base in Northern France the crew reported that they had attacked a railway station east of Christchurch. 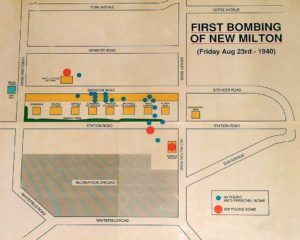 This devastating attack on our town was followed by a further two air raids one in 1942 in Spencer Road and another in 1943 in Vincent Road. Both of these raids resulted in further casualties. In 2011 New Milton Town Council erected a memorial clock at the southern end of Station Road opposite Smith Bradbeers department store. This memorial commemorates all of the civilian casualties suffered by Milton Paris in World War Two. In addition the names of the casualties are recorded on scrolls displayed in the town hall and in St Mary Magdalene church.